Why Is My iPad Charging Slowly? Here's The Truth! You are at:Home»iPhone»Power»Why Is My iPad Charging Slowly? Here’s The Truth! Your iPad charges very slowly and you don’t know what to do. You plug your iPad into a charger when you go to sleep, but when you wake up, it’s not even at 100%! In this article, I’ll explain why your iPad is charging slowly and show you how to fix the problem for good! The first thing to do when your iPad charges very slowly is to restart it. The software on your iPad may have crashed, which could potentially bog down the charging process. To restart your iPad, press and hold the power button until “slide to power off” appears on the screen. Then, use a finger to swipe the red power icon from left to right across the screen. Wait a few seconds, then press and hold and power button again to turn your iPad back on. 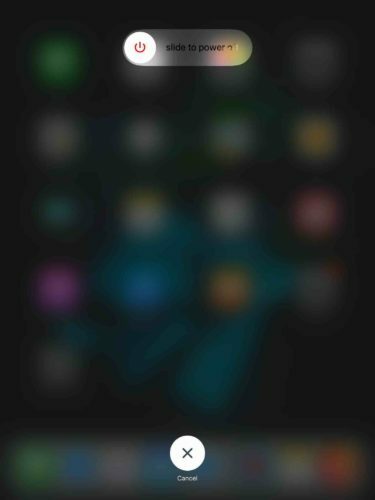 You can release the power button as soon as the Apple logo appears on the display. After restarting your iPad, it’s time to take a close look at your charging cable. First, inspect your cable for fraying. Apple’s Lightning cable are prone to fraying, and when they do, they can stop working properly. If your cable is damaged, or if your iPad is charging slowly anyway, try using a different Lightning cable. If your iPad begins to charge more quickly with the new cable, you’ll probably have to get your old one replaced. If your iPad is charging slowly regardless of what Lightning cable you use, try charging your iPad with a different charger. If your iPad charges faster with one charger, that charger may output higher amperage, or the original charger you were using may be damaged. Are All Chargers Made Equal? No, different chargers may provide different amounts of power. The USB port on a MacBook outputs 0.5 amps. The wall charger that comes with every iPhone outputs 1.0 amps. The charger that comes with every iPad outputs 2.1 amps. 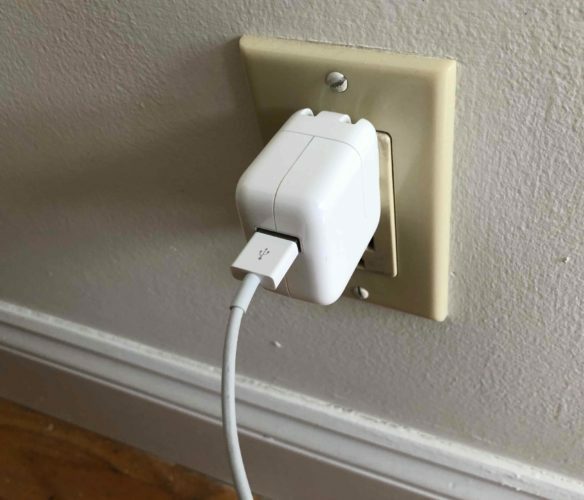 As you can imagine, the iPad charger will charge your device faster than the iPhone charger and the USB port on your computer. A lot of the time, a dirty charging port will make your iPad charge slowly or, in more extreme cases, prevent it from charging altogether. Grab a flashlight (or use the one built into your iPhone) and take a close look inside your iPad’s charging port. If you see lint or other debris inside the port, grab an anti-static brush and unused toothbrush and gently wipe it out. Afterwards, try charging your iPad again. If it’s still charging slowly, move onto our final software troubleshooting step! A Device Firmware Update (DFU) restore is the deepest restore you can do on your iPad. Every line of code is erased and reloaded and your iPad is restored to factory defaults. Before putting your iPad in DFU mode, create a backup of all the information stored on it. That way, you can restore from the backup and not lose all of your photos, videos, and other files. Watch our iPad DFU video to learn how to enter DFU mode and perform a restore! 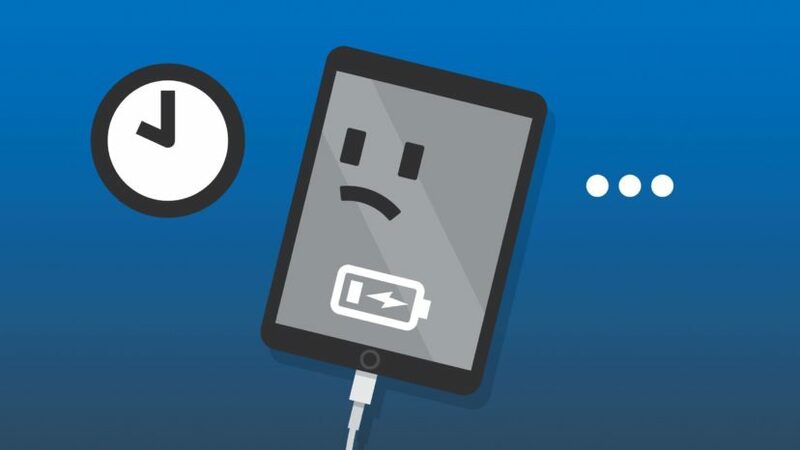 If your iPad still charges slowly after a DFU restore, it’s likely the result of a hardware problem and you may have to have the battery replaced. If your iPad is covered by AppleCare+ head to your local Apple Store and see what they can do for you. An Apple tech may also run a battery test on your iPad to see if it’s in proper working order. We also recommend Puls, a third-party repair service that sends a technician directly to you. That technician will replace your iPad’s battery on-the-spot (and sometimes charge you less than Apple). Your iPad is charging quickly once again, so you can spend more time using your favorite apps. I hope you’ll share this article with someone to teach them what to do when their iPad is charging slowly. Let me know which step worked for you be leaving a comment down below! Previous ArticlePuls TV Mount Promo Code | Save 10% Using Our Exclusive Coupon Code! Next Article What Is Two Factor Authentication On iPhone? Here’s The Truth!